The file type isn't supported in this editor. The file is in a binary format, like images. The file is too large and can't be loaded into the editor. The files you make on Octave Online will be saved for the next time you visit. Octave Command Prompt Type expressions here and press enter. Tip: Sign in to run script files. Signed in before but need to change your email address? Click "Feedback" and create a ticket. We will change it for you. Others can use the following link to connect to your workspace. Sharing is currently disabled. If you enable it, you get a link that you can use for real-time collaboration with colleagues. Icons made by Bogdan Rosu, Daniel Bruce, Sarfraz Shoukat, Icomoon, Freepik, Icon Works, Plainicon, and SimpleIcon are from www.flaticon.com and licensed by CC BY 3.0. 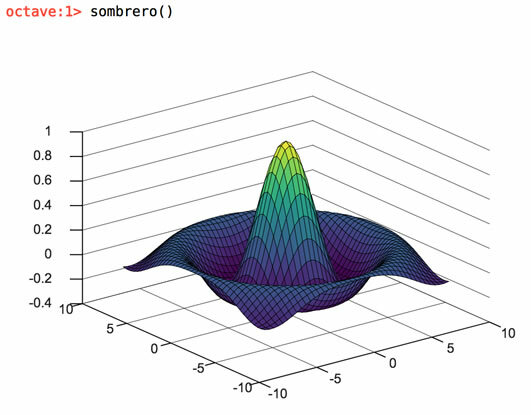 Octave Online is a web UI for GNU Octave, the open-source alternative to MATLAB. Thousands of students, educators, and researchers from around the world use Octave Online each day for studying machine learning, control systems, numerical methods, and more. Type commands in the prompt like you would in your local copy of GNU Octave or MATLAB. Sign in for more features: script files, buckets, real-time collaboration like Google Docs, extended runtime, and more. Octave Online is currently undergoing planned maintenance; service may be intermittent. Tip: For the latest updates on Octave Online server status, check our Twitter feed @OctaveOnline. You will be emailed an 11-digit code that you will need to enter on the next screen. Notice: If you have a yahoo.com, outlook.com, msn.com, or hotmail.com email address, your mail server might block the email token. If you are having trouble, try using a different email. New user? Forgot your password? Use the "email token" sign-in option instead. Once you are signed in, use the "Change Password" option in the menu to set a new password. Enter your new password below. To remove your password and disable password-based logins, leave the password field blank and click "Save Password". A "bucket" is how to publicly share snapshots of Octave Online script or data files. Select files and click the right arrow button. The "main" script is automatically run when someone views the bucket. After clicking below, your browser will refresh into your new bucket. You can share the URL of the page to which you are redirected. Hmm, looks like the server is busy today! We'll get you connected before you know it. Thanks for your patience. Thanks for waiting. It's not supposed to take this long. Please double-check your internet connection. If you are sure that your internet is working, consider contacting support.